“La Jornada” by artist Sonny Rivera and Betty Sabe. Located at Albuquerque Museum of Art. In 1600, Cristobal Baca came to New Mexico with the relief column of Captain Villagra. The muster role gives the following description: Captain Cristobal Vaca, legitimate son of Juan de Vaca, native of the city of Mexico, of good stature and features, swarthy, 33 years old, armed like the rest, took the same oath… The wife of Cristobal Vaca accompanied him and she was listed as: doña Anna Ortiz, daughter of Francisco Pacheco, wife of Cristobal Vaca, native of Mexico. She brought three daughters and a son: Juana de Zamora, Isabel, Maria de Villarubia and the boy, Antonio. She is taking a woman servant named Anna Berdugo, native of Mexico, unmarried. With these types of muster rolls, we get a good indication of who came as a family or family group. Much research has been done to further clarify who these families were, who they married and their descendants. The working CCM Project has validated many genealogies to clarify who descends from a “founder family” and the working result is that almost everyone affected with the Hispanic Mutation has a strong connection to the family of Cristobal Baca and Ana Moreno de Lara. The following chart points out the high-risk lineages that so far have been identified and carried down to current carriers. Thus far, the two children of Cristobal Baca and Ana Moreno de Lara appear to have carried this Hispanic Mutation. But not all their children. We did not include the non-affected children as this point. As time goes on and more people test and we can further work on the genealogies, other possibilities might arise – for now this is what we are working with. Researchers: Joyce Gonzales, Henrietta M. Christmas. Go to Forms, under “resources” to print out family tree on legal size paper. Research suggests that either Cristobal or Ana in the first generation was the first person to have had CCM1 in NM. Research suggests that Manuel Baca and his sister Juana “la vieja” Baca in generation 2 had a high risk of having CCM1. Research suggest that those children of Manuel and Juana listed in generation 3 also had a high risk of having CCM1. Manuel and Juana’s other children had a moderate risk of having CCM1. You would like to be tested while attending a workshop on The Baca Family Historical Project, but are not direct descends of Manuel or Juana Baca in generation 1. If you would like to do the swab testing at home and through the mail, you may do so testing under any circumstances. If you are positive for CCM1, your siblings and/or children may be eligible for free testing through the UNMH CCM1 study. *If you pay for testing and get a positive result, your test cost will be reimbursed. This is due to the fact that your testing has helped us to identify a new family line with CCM1. The consequences for this family could life changing. 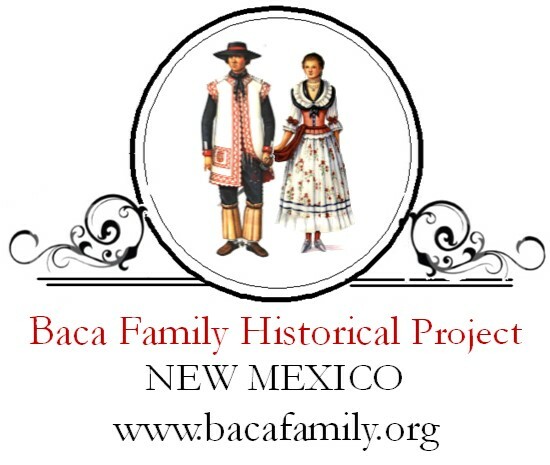 For more information contact Joyce Gonzales at (505) 473-1622 or Nora Chavez (505) 450-5902 with the Baca Family Historical Project. Check our Events page where we post information about our gatherings. We will contact you via email (please contact us to get on our list). You can submit stories, photos, family trees through this site and or stop by the booth with copies to share! Are you a Baca descendant?